The Exponential Marketing Bootcamp is a rare once-a-year opportunity to work with me for 36 intensive hours over THREE 12-hour days during this landmark event that has become legendary amongst Australian exponential marketing enthusiasts. This year’s Bootcamp combines the old with the new… It’s something I’ve been wanting to do for some time. Back in 2007, we had the honour and privilege to host the legendary marketing genius, Jay Abraham for his last Australian Bootcamp – EVER. 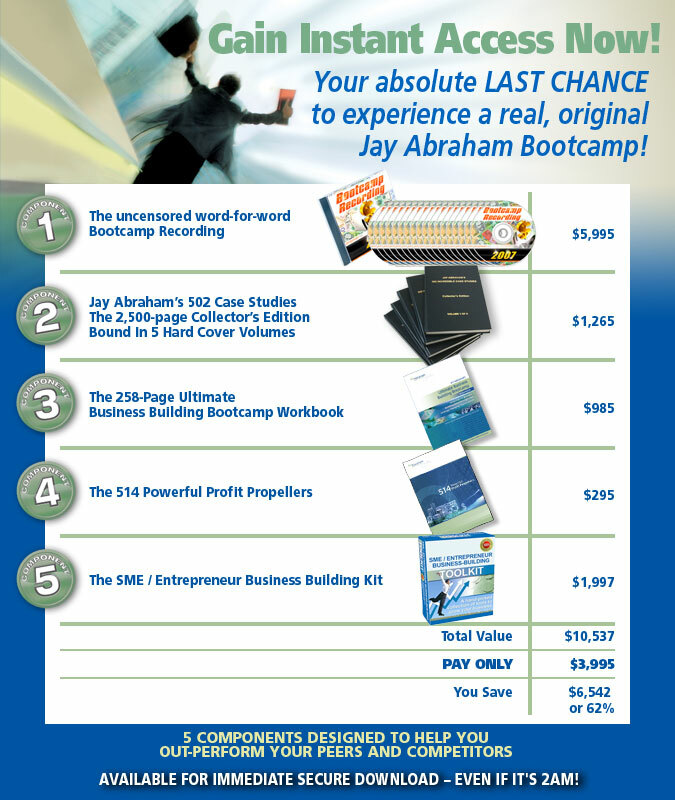 When it comes to producing exponential marketing results Jay Abraham has no equal. 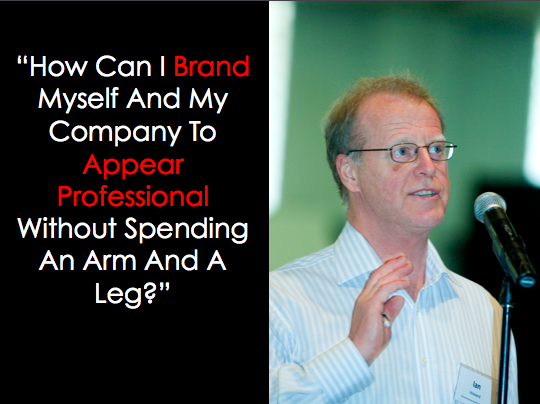 As you must know by now, Jay has been my #1 marketing mentor empowering and enabling me to become the best marketer I could ever be. I’ve taken Jay’s strategies and combined them with Tony Robbins’ peak performance and Brian Tracy’s sales strategies to become financially independent back in 2005, at age 42. What you may not know is that it was in my post-retirement that I became Managing Director of Jay Abraham Asia Pacific – as a result of attending Jay’s $25,000 Private Strategic Partnership event in Kuala Lumpur. Over and done with the “rat race”, I wanted to leverage my skills, abilities and aptitudes to help other aspiring entrepreneurs to get themselves out of their own entrepreneurial jail. You can’t do that if you have an effort-based model – you MUST transform it into a value-based model that is SYSTEMISED and AUTOMATED. 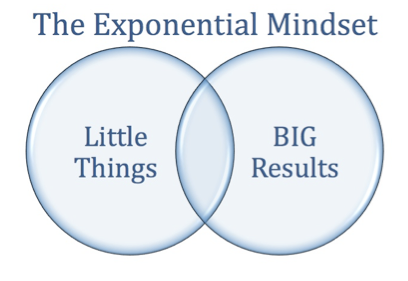 You must adopt Exponential Mindset Thinking™. they have no time to work ON their business. That’s why I wanted to get involved with Jay, but there was a condition. I didn’t want to stage one-off, “rah-rah” events that get people all pumped up for 3 days only to leave them alone afterwards when the excitement has died down, struggling to figure how to apply this in their own business. That’s when I created the Massive Momentum Memberships – priced from $195 to $2,495 per month to give small business owners the support they need within their budgets that matched their level of ambition and drive. The strategies we teach are so effective, that we actually GUARANTEE RESULTS in writing for our most elite Platinum Program. For the past 5 years, we’ve assisted hundreds of Australian entrepreneurs to add millions of dollars of sales to their bank accounts, finding hundreds of thousands of new leads and reducing their work week in the process. Back to the Bootcamp – where it all started for me and should start for you. I should know – one of my 5 university degrees is an MBA. if you had been given the opportunity to prepare? That is precisely why I created Pre Program Preparation™ for all my events, in fact I started creating it as a result of the annual Bootcamp based on feedback from graduates – once again proving that we practice what we preach! Pre Program Preparation™ is all about making sure you access, read, review, study and learn the grounding materials for the course, seminar workshop or event that you’re attending. In traditional courses, instructors waste up to 50% of the course time telling you things you already know and then running out of time for the things you really wanted to learn. Often, the Pre Program Preparation™ includes exercises that are introspective and therefore quite difficult to complete when first attempted. These are usually scheduled at the beginning of the cycle to give you sufficient time to revisit them once other Pre Program Preparation™ modules are completed. Many exercises are purposefully intertwined to reinforce each other so that each iteration in the process helps you get closer to the ultimate clarity that you seek. 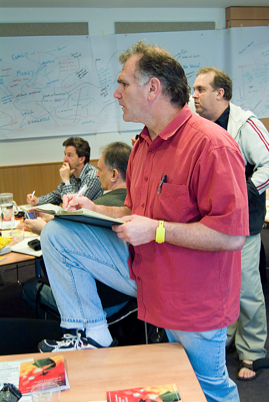 The goal of the Pre Program Preparation™ is to ensure that all attendees of the Bootcamp begin on the same page. Don’t worry – if you have questions, or have not finished all the exercises, you’re not expected to complete all the assignments perfectly. Just make sure you get them all started so they can be completed during the Bootcamp. 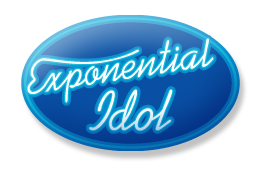 Will You Be The Next Exponential Idol? Since its inception, the Pre Program Preparation™ has now lead to the Exponential Idol Award™ – bestowed on the Bootcamp participant who creates the best result DURING the Pre Program Preparation™ exercise time frame – usually 4 to 8 weeks – PRIOR to the Bootcamp. Think about it – ACTUAL, REAL RESULTS being created BEFORE the Bootcamp even takes place – you have to admit, that’s E-X-P-O-N-E-N-T-I-A-L ! Some past winners completely paid for their Bootcamp tuition BEFORE stepping into the seminar room! 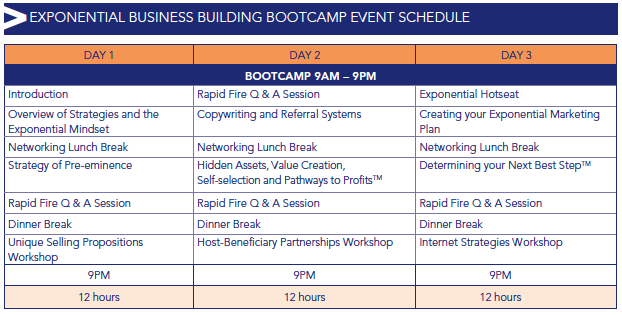 Throughout the 3-Day Bootcamp, there are several rapid fire sessions so you can have any question answered. It’s one of the most valuable aspects of the Bootcamp because every time someone asks a question, it’s another opportunity to learn something that is practical and useful. Often, a discussion breaks out into interesting ‘tangents’ that further explain and clarify concepts. Everything you’ll learn during these intensive 3 days is based on a process of training, layering, case studies, example-rich illustrations and hands-on interaction. Nothing is left to chance. What’s better than asking questions? Click on the image above to access the detailed explanation of what a Hot Seat is all about! 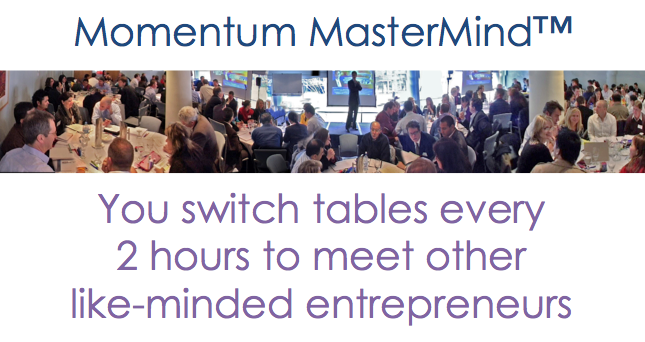 The Exponential MasterMind Experience™ is something I have developed and mastered over the past 5 years. I’ve written a white paper that explains it, which you can access by clicking on the hyperlink. 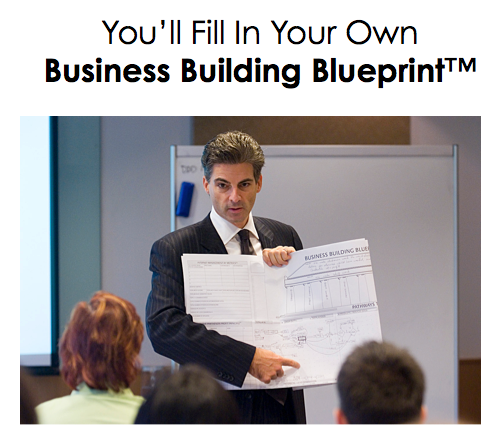 I also have an exclusively developed Coaching Philosophy and Mentoring Methodology including my proprietary Business Building Blueprint™ that helps you to determine your Next Best Step™ along your various Pathways To Profits™. On the last day of the Bootcamp, you will be able to calculate the specific, tangible improvements that this program represents to your business. 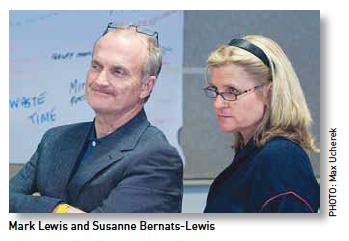 Others will share their insights for explosive compounded learning. This is by far the highlight of the event. You’ll be blown away at the innovative, creative and out-of-the-box ideas people come up with – ideas you can ‘capture’ and make your own. The 2011 event has been scaled down in quantity and scaled up in quality. Unlike previous years, there are no ‘discount’ seats or 2-for-1 special deals. Every single person in the room will have paid for the privilege of being part of the experience. As an attendee, you’re looking to create at least $100,000 of new additional income to your personal or business bank account in the next 12 months. With Exponential Mindset Thinking™, you know that acting strategically is MANY TIMES more powerful and financially rewarding that going for a quick one-time profit if it compromises long-term value and wealth creation. and within 2 or 3 days feel deflated and disappointed? 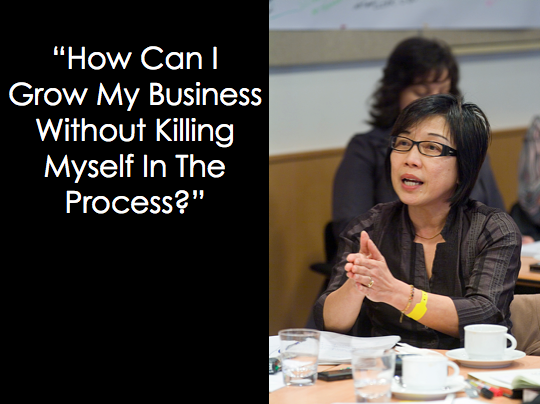 That is precisely why I created Post Program Planning™ for all my events, especially the Bootcamp. There is nothing worse than investing hundreds or thousands of dollars for an event and coming out of it without on-going support and an action plan that helps you implement what you learned. The Post Program Planning™ I’ve created is customised for each event and specifically tailored to each individual version of the event, so that you’re not getting a pre-packaged series, rather exactly what you need based on what actually took place at the seminar or workshop, in this case, the Bootcamp YOU attended. Nothing has been spared when creating, updating and deploying the Post Program Planning™ components. Each series is designed to ensure that you take what you learned at the seminar or workshop and apply it in your business or career immediately AND that you refine and fine tune them as you develop your own mastery and confidence. Post Program Planning™ can last several weeks to several months. There is no set limit to the bonuses and gifts included. In many instances, seminar and workshop participants communicate with us, sharing experiences, insights and distinctions worthy of being shared with other participants. When the contributions are deemed valuable, they are openly shared with the original source always given full credit. By involving you in the process, Post Program Planning™ is an essential part of the interactive experience that I create at all my seminars, workshops and events. If at any time, you see an opportunity for improvement, please provide your suggestion to us. We walk the talk of continuous and never-ending improvement. are the direct result of dozens of helpful suggestions that have made them what they are today. The triumvirate of the Pre Program Preparation,™ the live seminar or workshop event and Post Program Planning™ is a winning combination that is truly exponential in its design and delivery. It’s become the level of quality, thoughtfulness and proven methodology that you have come to expect. Psst! The Post Program Planning™ is specific to this Bootcamp – the Bootcamp Bundle and the VIP Memberships all run in parallel – to ensure you follow up and follow through after the Bootcamp. It is a little overwhelming at first, but consider this: If you get 30 to 50 ideas in a month, you’d have to agree that MOST of at least SOME of them are going to be great, terrific or fantastic! The objective is to give you the BEST STRATEGIES and IDEAS for you to cherry-pick from – so it’s little a “plug ‘n play” exercise for you, fine tuning and refining something that has already been tried and tested by others. NO MORE TRIAL AND TERROR! You get to bring your spouse or business partner along for free! We know that by participating in an intensive program like the Exponential Business Building Bootcamp with your spouse and/or business partner, your chances for success increase several-fold. The reason is that you can help each other navigate your new world of Exponential Mindset Thinking™ that may seem foreign to the uninitiated. This year’s Bootcamp has been desgined to shift you into Boundless Opportunity Thinking™ so you can embrace a (new) paradigm that is exponential marketing – where you set the rules and win the game and become the business champion you’ve always dreamed of becoming. 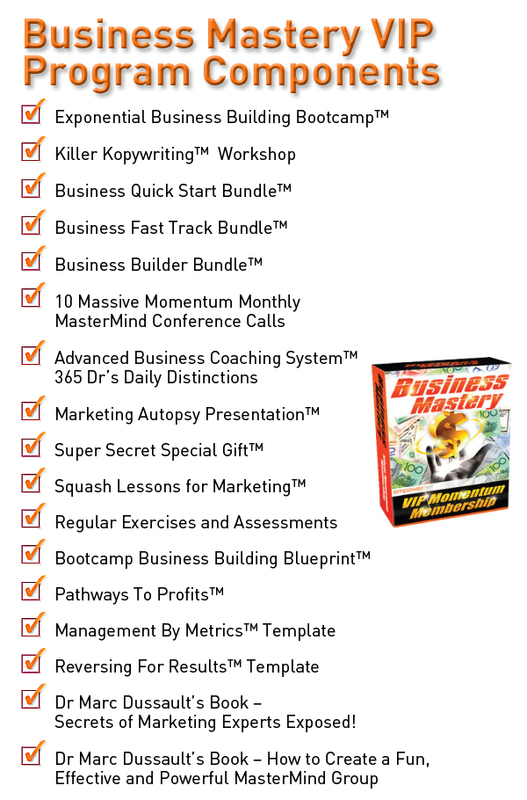 Hello, how much is this business bootcamp? I’d love to learn from the experts. I want to improve the results I am getting. I am coming to California in September… Check out the events we’re staging, courtesy of our Sponsor, Allegra Marketing Print Mail.